1. Iona, Stone with carved ship. Lower part of shaft of free-standing cross, or narrow cross slab. Stone type: Black shale, with thin limestone bands. 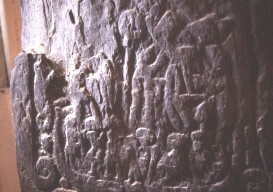 At the foot there is a ship which contains several small figures of men, some appear to be holding spears and swords, while others are hauling on oars.